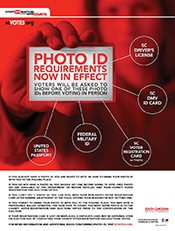 COLUMBIA, S.C. (September 25, 2017) - The South Carolina State Election Commission, along with Americans across the nation, will be celebrating National Voter Registration Day (NVRD) on Tuesday, September 26, 2017. This is a nationwide effort to register voters before upcoming elections in November. Celebrate democracy in America by encouraging individuals to exercise one of our most basic rights: the right to vote! 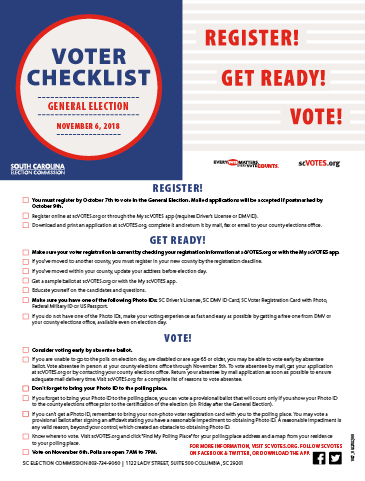 The State Election Commission encourages all South Carolinians to exercise that right in all elections, including the more than 150 elections being held throughout the state on November 7. The first step to doing that is registering to vote. But it's not only November. There's an election happening nearly every Tuesday somewhere in the state. 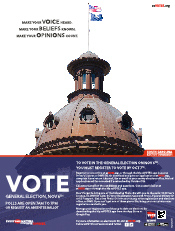 Click here for a complete list of upcoming elections. YOU MUST BE REGISTERED BY OCTOBER 8 TO VOTE IN A NOVEMBER 7 ELECTION. Click here to check your voter registration record. If you have moved from one county to another, you must register in your new county by October 8 to be eligible to vote. If you've moved within your county or changed your name recently, it will help ensure a smoother voting process for you - and your neighbors - by updating your information prior to November 8. Click here to update your voter registration information online. 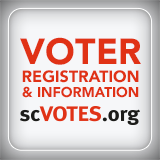 For more information on voter registration and elections, visit www.scVOTES.org. 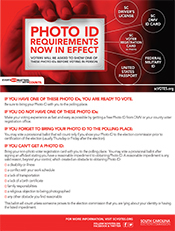 For more information on NVRD, please visit https://nationalvoterregistrationday.org/. Please promote NVRD this year by using #ReadytoVote on your social media accounts. 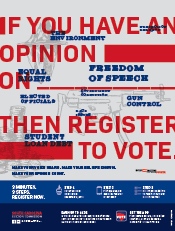 @CelebrateNVRD is the official twitter handle of National Voter Registration Day.